Christine Swanton offers a new, comprehensive theory of virtue ethics which addresses the major concerns of modern ethical theory from a character-based perspective. Discussion of many problems in moral theory, such as moral constraints, rightness of action, the good life, the demandingness of ethics, the role of the subjective, and the practicality of ethics, has been dominated by Kantian and Consequentialist theories, with their own distinctive conceptualapparatus. 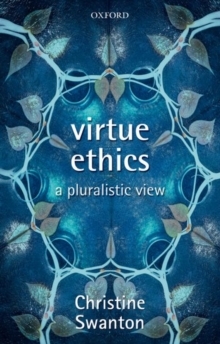 Virtue Ethics shows how a different framework can shed new light on these intractable issues. Swanton's approach is distinctive in departing in siginificant ways from classical versions of virtue ethics derived primarily from Aristotle. Employing insights from Nietzsche and other sources, she argues against both eudaimonistic virtue ethics and traditional virtue ethical conceptions of rightness. In developing a pluralistic view, she shows how different 'modes of moral acknowledgement' such as love, respect, appreciation, and creativity, are embedded in the very fabric of virtue, themoral life, and the good life.